Independence – When studying Drama, students work on their own to complete tasks. Working with others – Students will work with others as theatre companies to create both devised and text-based performances. Analysis – Any performer, director or designer must be able to take and understand information before applying it to create a performance. Communication – The ability to discuss key issues verbally and in writing is vital to any future success. Whether as a character or in rehearsals preparing for a performance, this is an essential skill. Time management – The skill of prioritising work is very important. By preparing performances and working through questions in an exam context, a GCSE (9-1) Drama student will have effectively developed this skill. Problem solving – Drama asks questions about society and the world around us. The skills used to discuss these problems and offer potential answers through effectively creating and preparing performances are the same as those used to solve real-life issues. Planning and organising – Creating Drama productions teaches students how to plan effectively to complete many different tasks presented to them. Pupils in all year groups will be able to find a variety of activities outside of their Drama lessons in which to develop their creative skills. Every year there is a school play being planned and rehearsed with opportunities for performers and back stage crew to be involved. 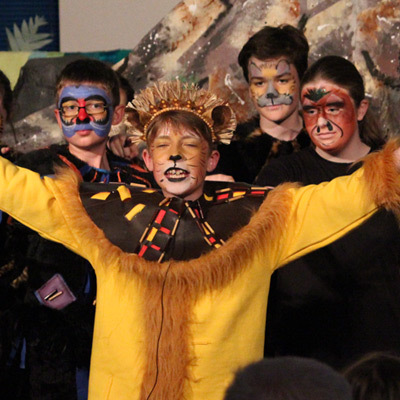 Recent performances such as The Lion King, DNA and Blue Remembered Hills have, in cooperation with the Art Department, provided opportunities for Stage design, stage building, costume making, lighting design, make up design, rehearsal, photography and display as well as performance. With the support of staff, two year 11 pupils have started a musical theatre group which enjoys the participation of around 50 KS3 boys and girls. This club runs at lunchtimes and has recently successfully hosted its first evening performance of song and dance work growing out of lunchtime activity. Acting Academy is a long established drama club which takes place [usually] on a Wednesday evening in the Drama studios. This club is intended to augment curriculum drama by providing drama related, fun activities; it is not about producing child actors but some previous members have gone on to develop careers in entertainment. The Academy is open to pupils in years 6 – 10 from any school in the Fareham & Gosport areas. The Academy is generally oversubscribed, so speedy applications with membership fees are advised for the securing of termly places. The details of this club and its membership form are on the school’s website. An essential element Cams Hill School’s excellent success in GCSE Drama is the supervised rehearsal sessions for GCSE Drama students after school. All such rehearsals will finish at 4.30 pm. Students are able to use these sessions to polish portfolio work, plan and rehearse performance material. With the new GCSE specification, evening performances of GCSE material may return as a regular feature of the school’s evening schedule. The relationship between Cams Hill School and Forest Forge travelling theatre [now Bumblefly Theatre] is over 20 years old. We know that the formal audience experience for a young person is a crucial element in their learning to appreciate different levels and genres of communication. We try to arrange at least one live theatre experience for yr7 around January, at a very nominal cost. The fact that the performance is hosted in their own school and is tailored especially for them helps to support their growing confidence and understanding of the potential for dramatic communication. Until recently Cams Hill School has been able to coach pupils for examinations in the London Academy of Music and Dramatic Arts. The upper levels of these examinations have UCAS [university entrance] points attached and have been very useful components in several students’ curriculum vitae, allowing them a little more choice, following their A level examinations, as to which university they attend. We hope to reinstate LAMDA tuition in the near future. Understandably LAMDA has been very popular and oversubscribed. It is advised that speedy application and payments will be necessary to secure termly places.